Born in 1931 in Jiangsu Province, Ru Xin is the contemporary aesthetician and philosopher of China. He worked as the vice-president of Chinese Academy of Social Sciences (CASS) during 1982-1998 and is the CASS Member and director of the Chinese Society of aesthetics and the vice president of International Council for Philosophy and Humanistic Studies. His main research areas include Western philosophy especially the classical German philosophy and aesthetics. 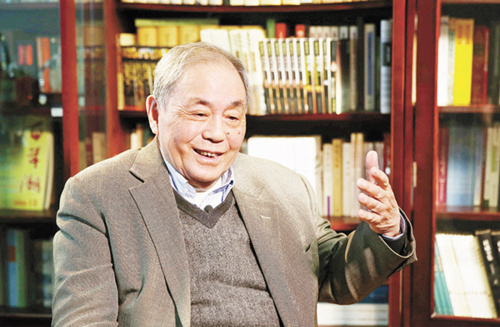 Ru Xin, former vice-president of CASS, is a graduate of St. John’s University in Shanghai, a veteran of the War to Resist US Aggression and Aid Korea and one of the first Chinese scholars to apply Marxism to the study of Western aesthetics. Ru recently looked back on his academic career and the history of CASS in the past 40 years in an interview with a CSST reporter. CSST: You worked as the vice-president of CASS for 16 years. What are your general feelings about the development of CASS in the past few decades? Ru Xin: In terms of academic and scholarly achievement, CASS has been on a smooth track of development—we have always had a rich reservoir of major national-level research programs. The academy’s recent academic achievements have surpassed any in the past. It was a big event in the past to write an excellent essay or publish a good book but it has now become normal for several new books to be published in a single day by the China Social Sciences Press and the Social Sciences Academic Press under CASS, most of which are authored by scholars from CASS, and the academic gains are astonishing. However, problems also persist. I have studied a series of President Xi Jinping’s speeches in recent years, particularly his speech at the Forum on Literature and Art in 2014, and my feeling is that the most obvious problem is that there are plateaus but a lack of peaks within CASS—that is to say, there are works but few masterpieces, and there is a lot of research but few breakthroughs. Definitely, there are excellent works produced in the sphere of some disciplines but the genuinely ground-breaking theories are still rare. At the Forum on Philosophy and Social Sciences, where President Xi also delivered an important speech, I talked about this issue, and the importance of constantly making theoretical innovations in addition to the overall academic improvement. I started working as vice-president of CASS in 1982 and retired in 1998. During the past 16 years, I assisted three CASS presidents and each of them has made indelible contributions to the thriving of CASS. CSST: You are the editor-in-chief and author of many works on aesthetics, some of which are pioneering works in Chinese academia, like the Treatises on the History of Western Aesthetics. In what way did your working experience at CASS impact your academic research? Ru Xin: It was by sheer chance that I began my career in aesthetics research. I majored in politics and minored in economics when I attended St. John’s University, Shanghai, which was a missionary school and featured some courses on philosophy and theology. I selected a course on religion taught by Xu Huaiqi, a famous professor in Shanghai who was also a pastor. His lessons enlightened me on the basic knowledge of philosophy but I had not studied aesthetics by that time. CSST: This verifies the saying “A watched flower never blooms, but an untended willow grows!” So how did you begin your academic research on aesthetics? Ru Xin: I started my study in the Institute of Philosophy at Chinese Academy of Sciences [CASS was formed by its separating research units of the Department of Philosophy and Social Sciences] in 1957, and my mentor was He Lin. I felt I was a poor student, especially compared with my classmates—my knowledge about Western philosophy was so poor that I studied quite hard. He Lin is a masterly scholar who excels in Western philosophy, Chinese Confucianism and the history of Chinese philosophy. He told me that to learn Western philosophy, a systematic approach is required and it is advisable to start from the study of the ancient Greek philosophers Plato and Aristotle. I did as my mentor said and bought large amounts of books to improve my learning. I read a lot about Chernychevsky and wrote an essay “Chernychevsky’s Criticism of Hegel’s Aesthetics,” which He recommended for publication in the journal Philosophical Research and that was how my first essay came into being. From then on, I delved into aesthetics step by step. CSST: There were not many scholars studying Western aesthetics at that time? Ru Xin: Only a few. The most well-known scholars who had systematically studied aesthetics were Zhu Guangqian and Zong Baihua. Wang Guowei had researched Kant and Schopenhauer, but he did not completely study the history of Western aesthetics. The essays in this realm of study are few so I decided to have a try with my own interest—I did some basic research on Western aesthetics, published some collections of essays, and compiled the four-volume History of Western Aesthetics together with my students. The book took us nine years to finish and it was really tough work due to the lack of sufficient research materials. Several of my students became scholars of Nietzsche study, and the first of them who studied Nietzsche after me was Zhou Guoping, who is influential in China. At that time, he also participated in the compilation of the third volume of the History of Western Aesthetics. CSST: A stronghold of Marxism, the topmost research center for philosophy and social sciences in China, and a key think tank for the CPC Central Committee and the State Council—that is how CASS is positioned. Could you talk about your views on the positioning of CASS? Ru Xin: As for the first positioning, CASS has always upheld Marxism as its guiding ideology, which our Party leaders stress. As for the second, CASS has always prioritized its function as the topmost research center for philosophy and social sciences in China. Some people say that despite the overall superior research level, CASS possesses fewer well-known and prestigious scholars than before. As I perceive, CASS needs to strive more to acquire the leading scholars in each discipline. Definitely, it is hardly possible for CASS to be first in each discipline, but it still needs to play a crucial role in leading the development of some disciplines. CASS has invested a lot in forging itself into a key think tank, and great progress has been made, but it needs more research on practical issues. In the past few years, CASS has been ranked first in most disciplines but now many universities have made great strides—so the situation is pressing, which presses people to make constant efforts. CSST: In the context of social transformation that China is undergoing, changes take place every day. So what is your hope for CASS and its research fellows? Ru Xin: Advance with the times. This is my hope. Living off one’s past gains is ignoble. I once wrote that I was deeply impressed by the Egyptian culture, with its immensity and craftsmanship, which is unparalleled. However, why did that splendid civilization fall and its glorious places become ruins? I have come to the conclusion that the decline of Egyptian civilization was caused by the failure of creativity and drain of innovation, without which, the glory of the past is doomed to perish. As for individuals, it is the same—trying to surpass oneself with each passing day. CSST: Well said! Finally, please summarize your academic research in the past years and your wishes for CASS, which just embraced its 40th anniversary. Ru Xin: I once wrote in an article that “Philosophical things are difficult,” which is paraphrasing Socrates, who said “Beautiful things are difficult.” Each age has its own distinctive characteristics, and we should not think in absolute terms about each era. Keep pace with the times and my feeling is that everything is temporary on a historical scale. There is no eternity. Academic self-confidence should be encouraged, but as time changes, the successors excel the predecessors. Last, I would like to express my hope for CASS as follows: I sincerely hope CASS could make constant innovation, aspire to new glory and be a qualified intellectual supporter of the CPC Central Committee and the people. CSST does not represent CASS alone. It should also be an advocate for Chinese academia and social sciences as a whole.